Walter Russell’s Atomic Suicide is Back In Print! Walter & Lao explain what radioactivity is, why and how it kills, and what to do about it. To begin with, I would like to point out that I (Joey Korn) personally am not against using nuclear power as a source of nuclear energy. Walter & Lao Russell definitely were! We’ve come a long way in learning to deal with nuclear energy since then. That being said, we’ve all seen, quite recently, the dangers of improperly protected nuclear power plants with the tsunamis in Japan. We still don’t know the long-term effect of those destroyed reactors in Japan and in the rest of the world. As the Russell’s wrote in 1957, “If we knew the WHY and WHAT of radioactivity we would not dare to use it.” Atomic Suicide? explains that WHY and WHAT. The truth about whether radioactivity can or can not be used as the next world fuel stands or falls upon one issue alone: can science protect organic life from extinction? The facts about radioactive death elements are clearly spelled out in this highly informative volume. For readers interested in the Russell science, Atomic Suicide?, while explaining the nature of radioactive elements, provides an excellent source of information about Russell concepts of the nature of the universe, including a philosophic discussion of the unity of science and consciousness. 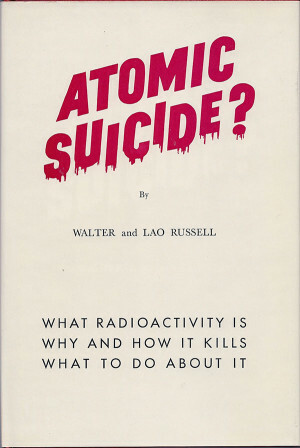 Many Russell enthusiasts consider Atomic Suicide? to be a better primer for the Russell science than the Secret of Light. Part I: What is Atomic Energy? ; How Radioactivity Kills; The World Voice. Part II: The True Nature of This Mind and Motion Universe; Prelude – The Transformation of Man; We Define God; The True Nature of Electricity and Gravitation; Our Eternal Universe; The Oneness of Gravity and Magnetism; The Mind Nucleus of the Atom; The Material Nucleus of the Atom. Part III: The Bridge Between Man and God; Nonconformity of the Lee-Yang Theory. We carry all Russell books currently in print, including some that officially are out of print, such as the Third Edition of the Russell Home Study Course: Universal Law, Natural Science & Living Philosophy. Click here to see our most popular Russell books, as well as links to more Russell books and Russell Book Sets with extra discounts. Posted on May 11th, by Joey Korn in Featured, Latest News, Shop.